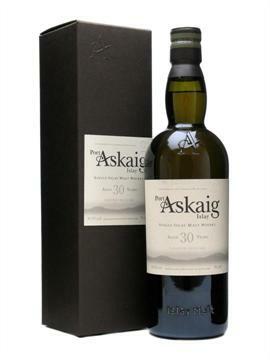 The Port Askaig 30 Year Old has recently been released and fortunately it is delivers delicious honeysuckle on the nose, then bonfire smoke and leafy oakiness on the palate. One of the most perfectly autumnal whiskies ever to be released. Available to buy at around the £150 mark you’ll be amazed at what great value it presents. Even better, if you compare prices here you’ll get the cheapest price available. Nose: nicely coastal, with wet sand and oyster, but quite fruity as well. A soft, liqueur-like fruitiness, rather exotic for a Caol Ila. Nice interplay of two characters. Lemon, honeysuckle, vanilla. A few medicinal notes in the background. Mouth: lemon at first, then some walnuts and almonds. Apricots. Peat as well, and a few salty notes, which make it sharper than on the nose. Again a nice showcase of older Caol Ila elements. Finish: long, with spicy smoke, hints of tea and salty fish. I’m fond of older Caol Ila. Port Askaig 25yo was already my favourite of the range and now this place is taken by the 30yo (although the 25yo has quite a price advantage). Very elegant while at the same time showing impressive power for a 30 year-old.